Colyton makes an excellent centre for exploring the delightful countryside of the East Devon Area of Outstanding Natural Beauty. This series of short walks, which can be downloaded and printed at home, or used on any compatible portable device, has been written for visitors and residents who would like to explore the local countryside but prefer to follow instructions rather than read a map. Once downloaded, the instructions can be folded and placed inside a medium-sized transparent plastic bag to protect it from the elements. All the walks, with the exception of Walk 6, start from the Market Place in the centre of the town. Great care has been taken to describe them as precisely and accurately as possible. There are signposts and/or directional waymarks on every gate, stile, and footbridge wherever the route leaves a road or crosses from one field to the next. Where it is considered helpful, distances in metres are given from one point to the next together with the approximate time it would take the average walker to cover that distance at an easy pace. 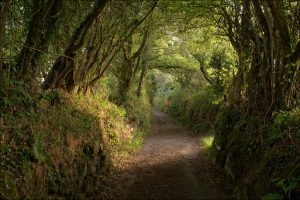 Devonshire County Council has a Rights of Way Department, staffed by dedicated professionals, who work hard, and successfully, to maintain more than 3,000 miles of the county’s public paths. Colyton Parish Council fully supports its path network and has voluntary wardens to inspect them. In addition, every one of these routes will be walked by the compiler of the descriptions at least once every two months to ensure that it is in good condition. Every route is fully way-marked with directional signs, and the gates and stiles are free of encroaching vegetation. Cattle and horses will be encountered on most of the walks. Dog-owners should be aware that they are permitted to take their pets on public paths providing that they are under close control and preferably on a lead; they must not let them wander at will. Farmers have a legal right to shoot dogs caught worrying stock. Don’t forget to ‘pick-up’ after your dog! The most useful map that covers the area in which all these walks are located is Explorer sheet 116 Lyme Regis & Bridport published by the Ordnance Survey and available from The Little Shop located at the bottom of Market Place. No special items of kit or equipment are required for these walks but stout footwear (wellies if you find them comfortable) are advised. Consider taking a light waterproof, a snack and water especially on the longer routes.